For years, search engine marketing was considered a black art, a dubious world of overpaying consultants to somehow get your website found in the huge and unwieldy web universe. But much of what lies behind SEO, what really works, has been demystified. 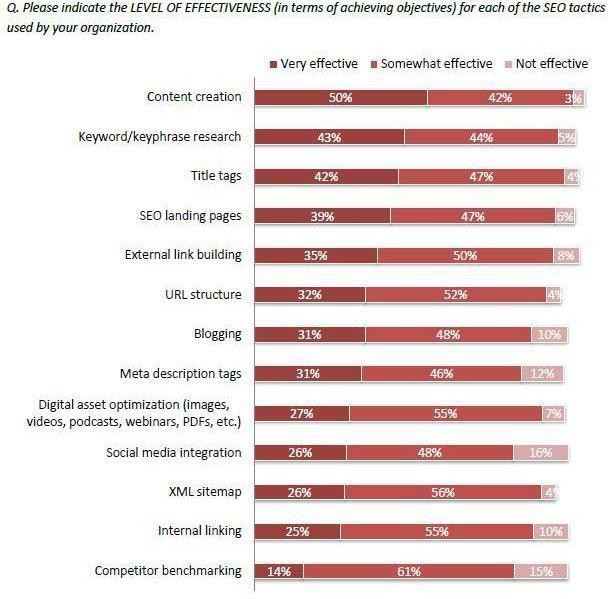 This chart, part of MarketingSherpa Search Marketing Benchmark Report – SEO Edition clearly shows the most important components of SEO, based on the response from over 1,500 marketers. Trying to game the search engines and their algorithms is passé and over. What rings true in SEO is the same formula used by companies conducting effective PR for eons…the undeniable human need to communicate meaningful information to inquisitive audiences. As you can see, content creation sits comfortably on the top with 92% of SEO marketers saying it is at least somewhat effective and 50% saying it is very effective. Keyword research comes in second with 87% saying it’s at least somewhat effective. These three tactics are as intertwined as DNA. Nothing I know of will generate more high-quality links on a consistent basis than good content that is published regularly. And more than 50% of SEO marketers use blogs to create content, according to the report. Even though creating content is the most effective SEO tactic, it comes in sixth in terms of popularity with 60% of marketers using it. This disconnection could be due to the difficulty of creating content, and I recently heard a great example of how to simplify the process and get started. Marcus Sheridan, Co-Owner at River Pools & Spas, had some great advice at our recent Optimization Summit on how to dive into content creation (Dive! Get it?). Sheridan outlined the simple tactics he used to blog his company’s website into the world’s most popular swimming pool site in terms of traffic. First, gather everyone in your company and ask them to list the top questions they’ve received from prospective customers. Write down a list of 50. Those questions are the titles of your first 50 blog posts. “As a pool guy, as soon as someone calls us on the phone, what do they ask? What do they ask in every industry? — How much does it cost? That’s the first question all the time,” Sheridan said. Some companies are afraid to answer questions about price or to directly compare their products to alternatives (which is another popular question). 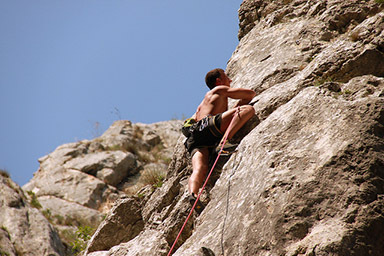 Sheridan urged companies to overcome their discomfort. Prospective customers are asking these questions, regardless. Who would you rather have answering them? “We can’t be afraid to talk about anything that the customer wants to talk about; the good, the bad and the ugly,” he said. Once you gather questions from your team — keep everyone involved. Get them excited about writing a blog post to answer a question. Divide the work across the company and set a strict schedule. “If you set 50 titles and you do two per week, then you have 25 weeks’ worth of blog content. Within that six months time, everything will start to change for that company and that business and the traffic they’re starting to get on their website,” Sheridan said.